The availability of clean, potable water is a concern for everyone, from residents here on Earth to astronauts in space. To address the issue, researchers have recently begun studying plasma-based technologies as a cost-effective method to purify water. The process, simply stated, involves removing pollutants from water by turning air bubbles into a plasma, or ionized gas, state and then releasing the chemicals produced inside those bubbles back into the liquid. The problem, however, is executing this process at scale. 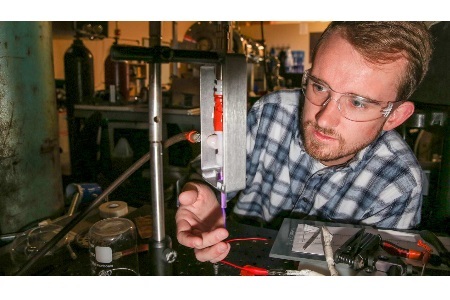 "Plasma at atmospheric pressures likes to stay as small as possible in small volumes," says Dr. Gabriel Xu, an associate professor in the Department of Mechanical and Aerospace Engineering at The University of Alabama in Huntsville (UAH). "So getting it larger is a decent challenge." Helping Dr. Xu tackle that challenge is Ph.D. candidate Ryan Gott. The pair had worked together previously, with Dr. Xu serving as Gott’s advisor for his master’s thesis on using plasma-based technology for satellite propulsion. And it was Dr. Xu who encouraged Gott to continue building on that experience for his doctoral research. "He showed me a list of projects to choose from, and water purification using plasma-based technology was one of them," says Gott. "I thought the idea was really cool, and because it was related to the work we had already been doing, I knew we had the technology to make an impact on it. It was serendipitous." So, too, was the timing. That fall, UAH was selected as the lead institution on a $20M, five-year grant from the National Science Foundation’s Experimental Program to Stimulate Competitive Research (EPSCoR) to fund the "Connecting the Plasma Universe to Plasma Technology in Alabama: The Science and Technology of Low-Temperature Plasma" (CPU2AL) project. With its emphasis on plasma processes and interactions in low-temperature plasma environments, the project synched perfectly with Gott’s interest in water purification using plasma-based technology, and the pair was able to apply for and receive support for their research. CPU2AL now provides funding for supplies and materials for Dr. Xu’s Plasma and Electrodynamics Research Lab, while Gott receives financial support through the Alabama EPSCoR Graduate Research Scholars Program. "I’ve got a few classes left, which I’m working on concurrently," he says, "but it’s basically a full-time job!" While the CPU2AL project comprises three major research thrusts – Particle Kinetics in Low-Temperature Plasma, Electron Interactions with Electromagnetic Fields and Collective Phenomena, and Plasma Interfaces – it is the latter that most closely aligns with the work that Gott and Dr. Xu are doing. "Our focus is on developing low-temperature plasma water-purification technology for three applications," says Dr. Xu. "The first is manned space travel, the second is chemical and industrial cleanup, and the third is in developing countries where water sources may be polluted with bacteria." Key to their research is an atmospheric-pressure plasma jet originally design by Dr. Xu. It works by feeding a propellant gas – typically argon or helium in the lab – through a tube where it is ionized and pushed out as a plasma plume. The electrons from this plume then react with water molecules to produce OH radicals, which drive the purification process. "I’m still working on improving the design, but we have the basic plasma technology," says Gott. "What we’re trying to do now is understand how changing the power operating conditions, gas flow rate, and tube size can affect the size of the plasma plume by studying the production of OH radicals using optical emission spectroscopy." Since presenting their most recent research results at last month’s 71st Annual Gaseous Electronics Conference in Portland, Ore., and being recognized by the American Physical Society, their work has focused on fully characterizing their existing plasma jet and increasing the plasma size by experimenting with the jet’s design.. "We’re doing pretty well so far using a 3-D printer to quickly and cheaply test different channels and designs," says Dr. Xu, adding that, at present, they are capable of creating a 2 inch wide and ¾ inch thick "sheet" of plasma. After that, says Gott, "we’ll study the interaction between the plasma and the water and the air, and figure out how we can best shape it to suit our needs." Each step brings them closer to their ultimate goal – a complete understanding of the plasma physics and behavior so as to design better plasma-based water purification methods for the aforementioned applications. "Once we understand the plasma itself," says Dr. Xu, "then we’ll have a better idea of how to scale up." This material is based upon work supported by the NSF EPSCoR RII-Track-1 Cooperative Agreement OIA-1655280. Any opinions, findings, and conclusions or recommendations expressed in this material are those of the author(s) and do not necessarily reflect the views of the National Science Foundation.